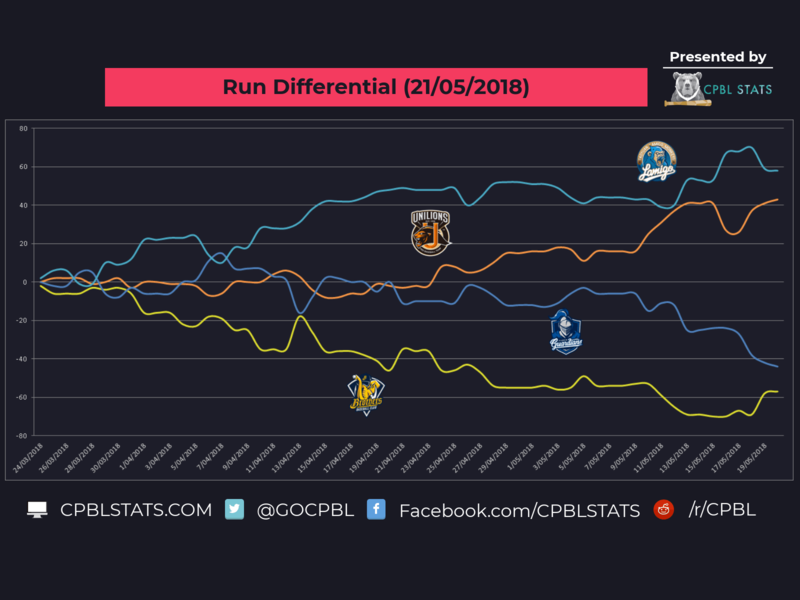 With 80 games into the 2018 CPBL season, here is another edition of the CPBL debrief (21/May/2018). We will be covering the basic overall graphical standings, run differential, average attendance record and a few nice plays highlight. 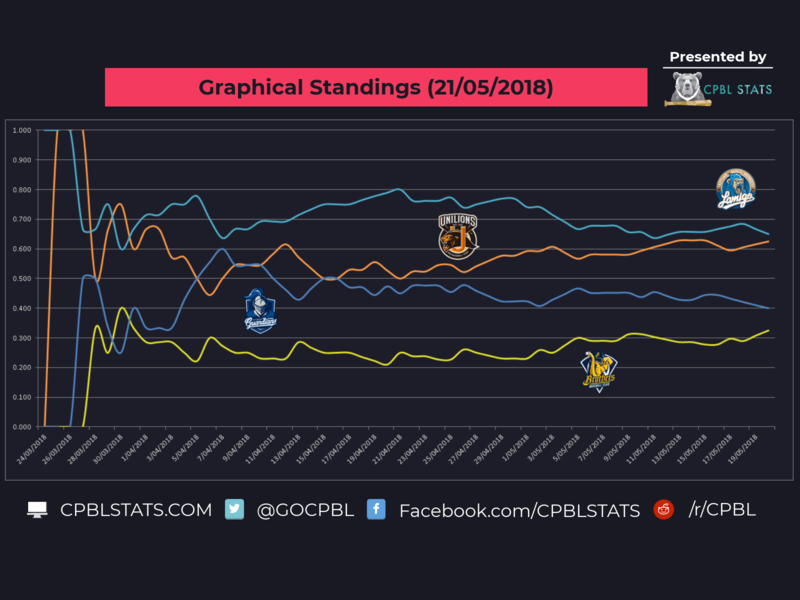 The Lamigo Monkeys are currently leading the league with 26 wins and 14 losses. As a team, they are hitting .330/.394/.494 with a team ERA of 4.91 and 1.54 WHIP over 40 games. 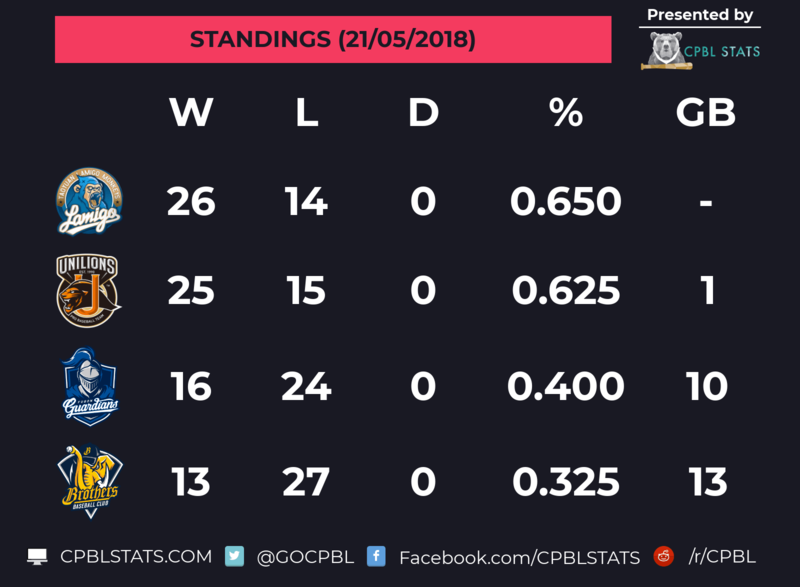 After winning eight out of the last ten games, the Uni-Lions are in the second place with 25 wins and 15 losses with just a game behind the Monkeys. The Uni-Lions are hitting .290/.354/.454 with a team ERA of 4.66 and 1.40 WHIP. It is also worth mentioning after last night’s victory, the Uni-Lions are now on a 12-game win streak against the Fubon Guardians. Both the Fubon Guardians and the Brothers are struggling in the first half season with the elimination number at 11 and 8. The Guardians currently slashing .271/.340/.385 with a team ERA of 5.72 and 1.52 WHIP. While the Brothers are starting to pick up a few wins here and there with their new “Fake starting pitchers” tactic, with a team stats of .284/.343/.442, 5.91 ERA and 1.66 WHIP. 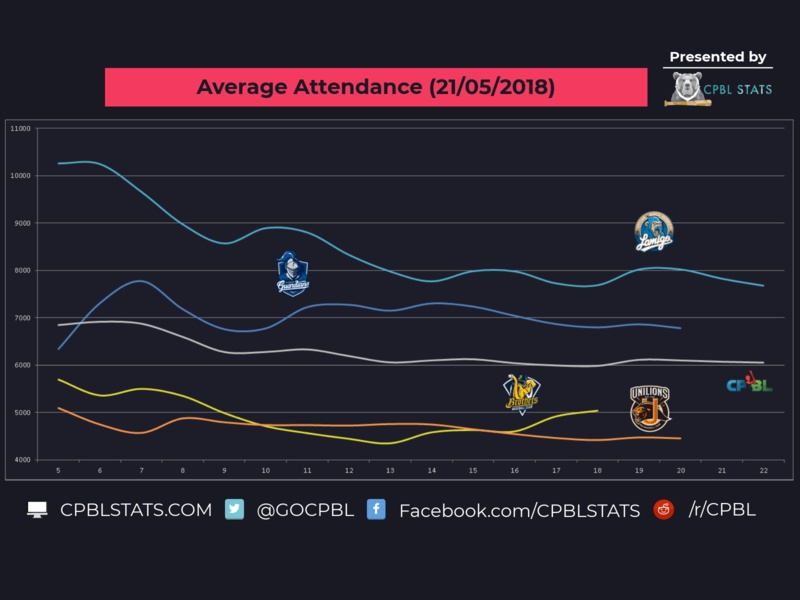 Here is the “average attendance percentage vs the league average attendance”. I guess in a way, we can call it “The Attendance Plus/ ATT+”. 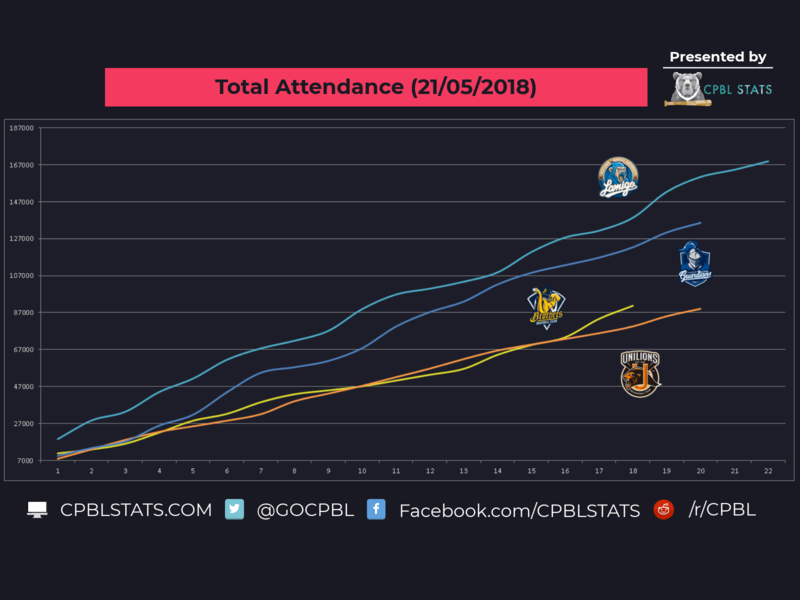 Just think of this as the “OPS+, wRC+ and ERA+” but it is use for for attendance. So, how do we use the “ATT+”? The league average will equal 100. 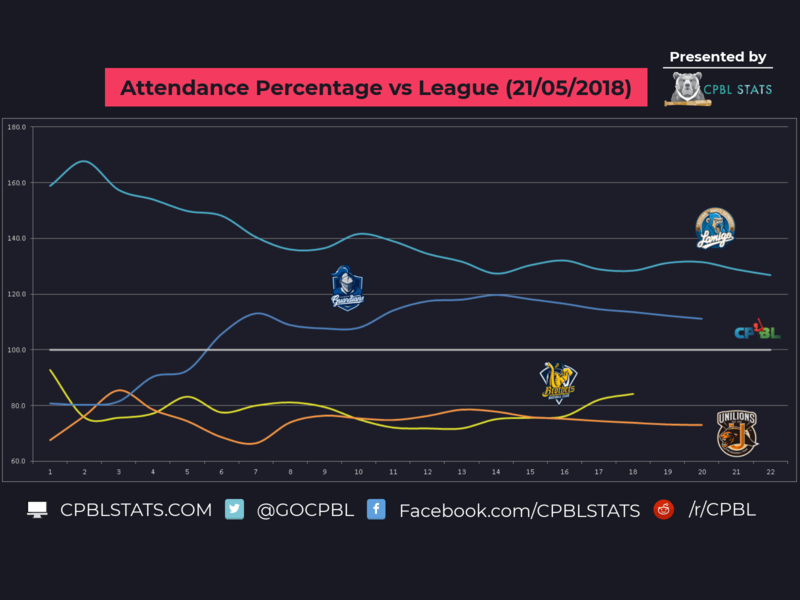 If a team’s ATT+ is 160 then the team is performing 60% better than the league average attendance. Whereas if a team’s ATT+ is at 60, then that team is performing 40% lower than the league average attendance.